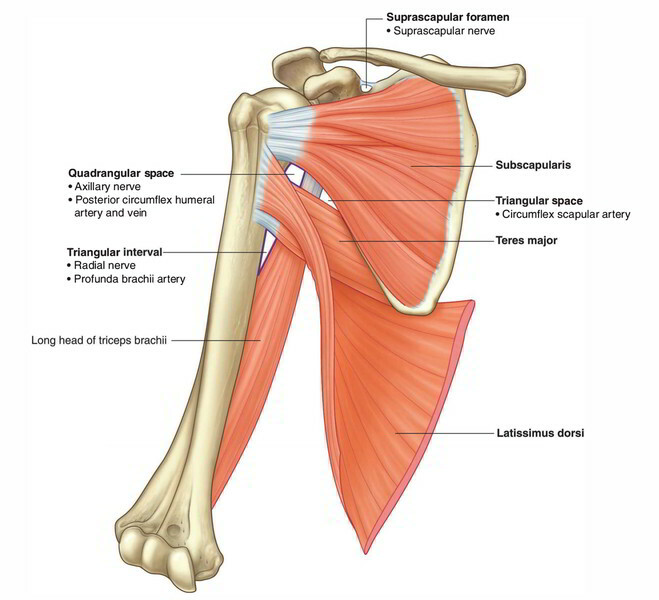 Subscapularis is a bulky triangular muscle, which fills the subscapular fossa. Subscapularis originates from (a) medial 2/3rd of the costal surface of the scapula and (b) tendinous intermuscular septa connected to the ridges on the bone. The fibres converge laterally into a broad tendon, which enters in front of the capsule of glenohumeral joint to be inserted on to the lesser tubercle of the humerus. The tendon is divided from the neck of the scapula by a large subscapular bursae, which usually interacts with all the synovial cavity of the shoulder joint. The subscapularis is supplied by the upper and lower subscapular nerves (C5, C6). The subscapularis crosses the glenohumeral joint anteriorly from medial to lateral (with its fibers running horizontally in the transverse plane). However, it does not attach onto the first aspect of the humerus that it reaches, but rather wraps around the humerus to attach onto the lesser tubercle. Therefore when the subscapularis contracts and the humeral attachment is pulled toward the scapular attachment, the anterior side of the humerus moves medially. This movement is called medial rotation of the arm at the glenohumeal joint, because the anterior side of the humerus rotates medially. Note the similarity of the direction of fibers of the subscapularis to the direction of fibers of the latissimus dorsi and teres major. If the subscapularis contracts and the humerus is fixed, the subscapularis pulls the medial border of the scapula against the rib cage wall. This is called medial tilt of the scapula and occurs relative to the humerus at the glenohumeral joint. When the scapula moves relative to the arm at the glenohumeral joint, it also moves relative to the rib cage at the scapulocostal joint. There is controversy regarding whether or not the subscapularis can perform other actions of the arm at the glenohumeral joint. Some sources state that depending on the position of the arm, the subscapularis adducts, abducts, flexes, or extends the arm. However, given that its attachment site is so far proximal on the humerus, its lever arm would be poor. If these actions did occur, they would be very weak. Because the lower fibers of the subscapularis are below the axis of motion of the glenohumeral joint, they may contribute to the reverse action of upward rotation of the scapula at the glenohumeral and scapulocostal joints. Have the client supine with the arm that is on the side of the target muscle being palpated crossed on the chest such that the elbow is lying on the abdomen and the hand is holding onto the opposite-side shoulder (the arm will be slightly flexed and adducted at the glenohumeral joint, and the forearm will be flexed at the elbow joint). Further, have the client place the opposite-side hand on top of the elbow of the arm that is crossed on the chest, gently holding the elbow down. Place your superior (cephalad) hand under the scapula, grasping the medial border of the scapula and pulling the scapula laterally (protracting the scapula at the scapulocostal joint). With your (inferior) palpating hand, press in between the scapula and the ribcage of the client and then press with your finger pads against the anterior surface of the scapula for the subscapularis.